When you’re managing the closing of a complex financing transaction like that of a commercial mortgage-backed security, a detail-oriented checklist is your best friend. 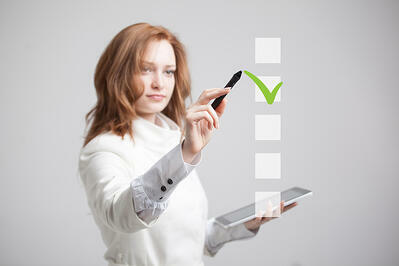 Checklists are used by so many people every day to manage tasks, both personal and professional. Atul Gawande, author of The Checklist Manifesto: How to Get Things Right, highlights the power of checklists as written guides that walk us through the key steps of any complex procedure or transaction. Doctors, pilots and attorneys have historically used detailed checklists to ensure that even the smallest action items are accounted for and that the responsible party is identified. Across my experience working at a law firm, in-house at a publicly traded company and now at a service company, checklists have long been integral in managing projects. As you can imagine, the quote above from Mr. Gawande resonates deeply with me – especially when it comes to closing checklists for transactions. Why Use a Closing Checklist? A closing checklist for a merger or commercial finance transaction can sometimes far exceed 20 pages. Working as a paralegal, managing the items and documents on one of those massive closing checklists, I would clearly outline who was responsible for each item and note which resources/service providers I could rely on for completing or obtaining what I was responsible for, in advance of a closing. The specificity and attention to detail that a checklist allows for can help ensure that the overarching legal transaction is carefully documented, and all actions are taken to protect the parties in the transaction. 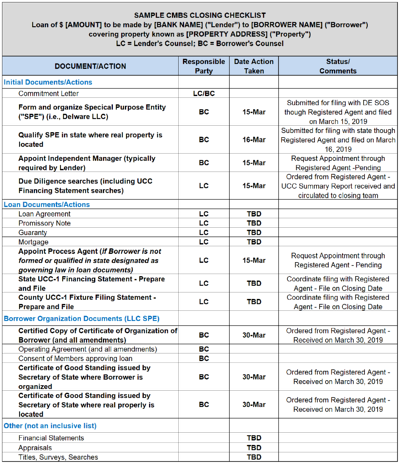 A missed UCC securities filing in a commercial real estate transaction, for example, could result in the loss of the priority interest in the collateral securing the lender in the transaction. The consequences can be significant. Submitting a Certificate of Formation to form a Delaware LLC as a single purpose entity (SPE) or bankruptcy remote entity (BRE) borrower. Qualifying newly formed SPEs/BREs in the state where the commercial property is located. Acting as independent manager for the transaction. Support public record searching for UCC filings. Obtaining certified charter documents and good standings. Typically, the attorneys and paralegals we work with note the date they communicate with us for any of these services and the status of the filing(s) or document(s) requested. These actions all feed back into their larger transaction checklist. 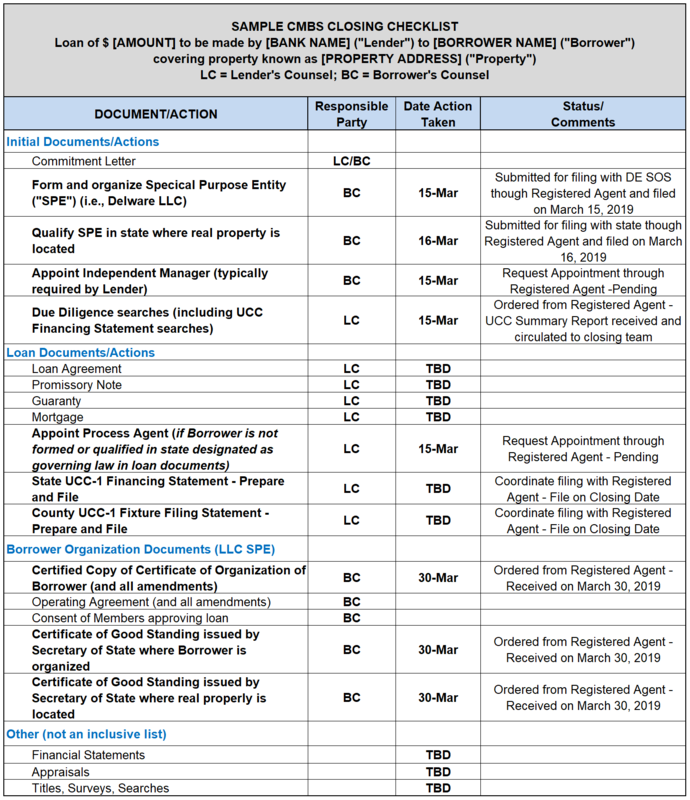 Below is a sample checklist highlighting some of the core actions typically found on a closing checklist for a CMBS transaction. Note: This is not intended to be used as a complete closing checklist. You’ll notice the sample checklist above includes columns designating which party is responsible for a line item, dates marking when an action was taken and a column with notes on an item’s present status. Together, these pieces of information help the closing team track what is happening, including those items covered by service companies. Keep in mind, your closing checklist is a living document. Deadlines can change and additional documents or actions might be added as the CMBS transaction is negotiated. Closely managing and maintaining your closing checklist as these complex financing transactions proceed is an important key to a successful closing.